Use the optional Chores feature to keep give your student a well-rounded day including school work and family responsibilities. Chores can be any task you desire and can be assigned to your students to appear along with their schoolwork in the Agenda and be included in the Daily Task List of work to be done by your student. This Help Page deals with assigning Chores to Students. Please see the Chores Help Page for information on creating the actual Chores and their directions. You can add a single Chore entry for one or more Students or create multiple Chore entries for one or more Students using the Add Chore form. The Add Chore form is a tabbed area. Click on a tab name to move to that area. You can move back and forth as many times as you need as you adjust your option settings. 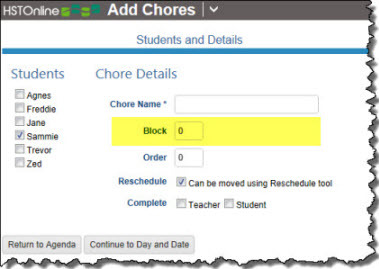 In the left tab, you will select the Students who will receive the Chore(s) and set the Chore Name, Time or Block, Order and Reschedule options for the Chore(s). Students: Choose the Students who will receive this Chore. 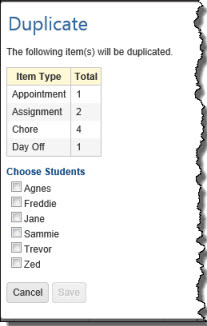 Click or touch the check box for each Student you want to include for this Chore. press the space bar to get a list of all your active Chore Names, scroll to the one you want, and click or touch the entry to accept that selection. enter the name of a new Chore Name into the field. The new Chore will be added to your Chore Names list. You can go there to add any instructions needed for the new entry. Once you have selected a Chore Name, any instructions that have been entered for the Chore will appear below the Complete field in a yellow box. Time Start/End or Block: The field that appears (Time or Block) depends on your settings in Program Options. Set the Start/End times or Block for the Chore, or leave these fields blank. Order: This field appears only if enabled in Program Options. Enter the Order value for this Chore or leave it blank. Reschedule: Check the box if you want this Chore to be able to be moved to a different date using the Reschedule feature; leave the box empty if you do not want this Chore to be able to be moved using Reschedule. The box is checked by default. Complete: If desired, you may mark the Chore you are creating as Complete. If you check the Teacher or Student Complete boxes here, they will be checked for all Chores created as part of this process. Day Options: Set the parameters for the Chore(s) to be created. Daily: HSTOnline will gather a list of all dates that fall within your selected date range, remove the dates that violate your 'Skip' settings, and then place a Chore on each date int he date range according to your 'Every_Day' entry. Monthly: HSTOnline will gather a list of all dates that fall within your selected date range, cull the list to only those dates which match the date of the month or # day of the month you have selected (First Tuesday, Third Monday, etc.) and then remove from the remaining dates any that violate your 'Skip' settings. Finally, HSTOnline will place a Chore on each remaining date in the date range. To create a single Chore, set the Start Date and End Date fields to the same date. If you choose 'Continue to Preview', HSTOnline will show you the Chores that will be created based on your option settings. Use this opportunity to review the items before accepting them to be added to your database. If the results are not what you expected, you can click or touch the Students and Details tab or the Day and Date tab to reset your options and then click or touch the Return to Preview button to see the new results. you can click or touch the checkbox for each Chore you want to accept. 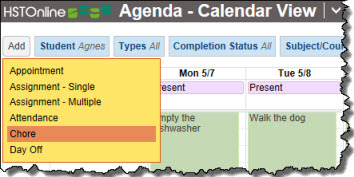 'Accept Selected Items' to add the highlighted Chores to your Agenda. Copy Over Date Range: Select any single assigned Chore to use it as a starting point to create Chore entries for one or more Students over a range of dates, following the Daily, Weekly or Monthly pattern you set. 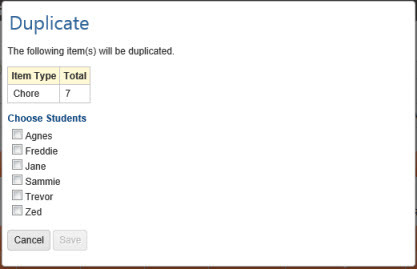 Duplicate: Select any one or more assigned Chores and duplicate them for another Student or Students. You can select any single Chore and use it as the basis for creating new Chores for one or more Students over a range of dates, following the Daily, Weekly or Monthly pattern you set. The Copy over Date Range process uses the same form as the Add Chore form outlined above and fills in the Chore Name, Time/Block, Order, Reschedule and Complete fields from the original item. You can change these fields as needed. If you copy a Chore that has been marked as Teacher or Student Complete, the copies created will also have those fields marked as complete. Copying Chores is only available from the Agenda - List View page. Click or touch the Chore you want to Copy. Click or touch the Action button and choose 'Copy over Date Range' to open the Copy Chore form. Select the Students who will be receiving the new items. The Student attached to the original Chore will already be selected. Choose any other Students you want to create new Chores for. Set the Chore Name, Time/Block, Order, Reschedule status and Complete fields.. These fields will show the details of the original Chore. Change the settings as needed. Click or touch the Day and Date tab or the Continue to Day and Date button to access those options. Click or touch Continue to Preview to review the Chores that will be created. you can click or the checkbox for each Chore you want to accept. Use this feature when you have Chores created that you need to duplicate with the same Date, Chore Name, Time/Block, Order, Reschedule and Complete status for another Student or Students. Duplicating Chores is only available from the Agenda - List View page. 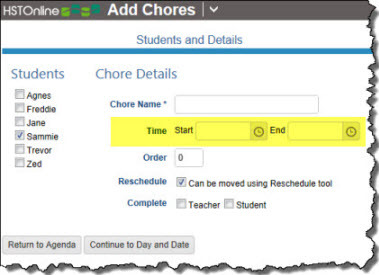 Set the Date Range, Students and Types filters to display the Chores you want to duplicate. Select one or more Chores that you want to duplicate. You can use your mouse to click and drag over contiguous Chores to select those items. On a touch device, you can touch and drag your finger over contiguous Chores to select those items. You can edit any single Chore or any group of Chores to change any field for the selected item(s). You can edit any single Chore to change any field selected item. Set the filters to view the Chore you want to change. Set the Date Range, Students, and Types filters to display the Chore you want to edit. Double-click on the Chore you want to change to open the Edit Chore window. Alternatively, you can click once on the Chore you want to change and then click the Action button and choose Edit to open the Edit Chore window. On a touch device, touch the Chore you wish to edit and then touch the Action button and touch Edit to open the Edit Chore window. The Previous or Next hyperlink in the top right corner to save your changes to this Chore and move to the previous or next Chore in the list. You can click or touch Previous or Next until you have made all the changes you want to your Chores and then click the Save button to end the Edit process. If you reach the beginning or end of the list when clicking or touching Previous or Next, the Edit window will close and you will be returned to the list view. 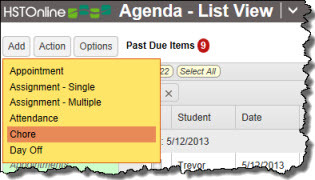 Note: When using Previous/Next, HSTOnline will move to the next or previous item of the same type - in this case, Chores - skipping over the other items in the Agenda - List View. You can edit any selected group of Chores to change any fields for the selected items. Choose the Chores you want to multi-edit. Click the checkbox for each Chore you want to change. You can use your mouse to click and drag over contiguous Chores in the list to select those items. On a touch device, you can touch and drag your finger over contiguous Chores in the list to select those items. 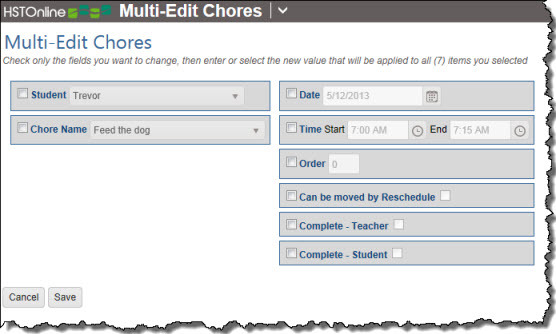 Click or touch the Action button and click or touch Multi-Edit to open the Multi-Edit Chores window. If your selection includes Chores and other item types (Appointments, Assignments, Attendance, and/or Day Off) the Multi-Edit option will be disabled. Reselect items to include only Chores. The fields in the Multi-Edit window will show the settings for the first Chore in your selection. To enable the form, click or touch the box to the left of each field you want to change for all selected Chores. Make your selection for each of those fields. You can mark any single Chore as Completed using the Edit feature. However, you can use the Mark as Complete to mark one or more Chores as Complete without having to open the items to do so. 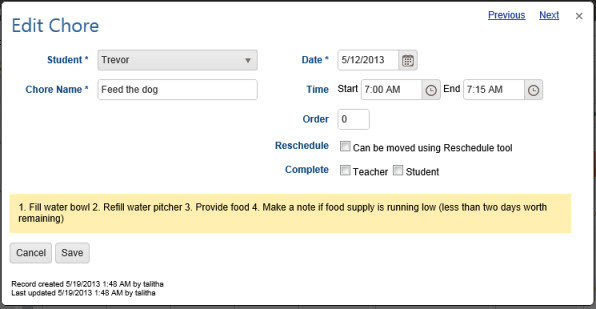 When the Complete by Student field is enabled, Student users can utilize this feature to mark their Chores as Student Complete. Those logged in under an Administrator or Teacher account can use this feature to mark the selected items as Teacher Complete. Use this feature to mark any one Chore as completed while in the Agenda - Calendar View. Set the Student, Types, and Completion Status filters to display the item you want to work with. Use this feature to mark any one or more Chores as Complete at the same time. You can use the 'Mark as Complete' feature to mark Assignments and Chores as completed at the same time. Your selection can include items that are neither Assignments nor Chores. HSTOnline will simply ignore those items that are not eligible to be marked as completed. Set the Date Range, Students, Types and Completion Status filters to display the items you want to work with. Choose the Chores you want to mark as completed. Click the checkbox for each Chore you want to mark. Click or touch the Action button and choose 'Mark as Complete'. All the selected Chores will be marked as completed. If logged in under a Teacher account, the Teacher Complete box will be checked and a T displayed in the Complete column. 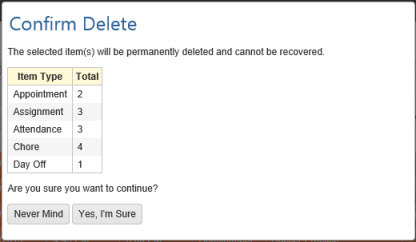 If logged in under a Student account, the Student Complete box will be checked and an S displayed in the Complete column. You can delete any single Chore from the Agenda - Calendar view. 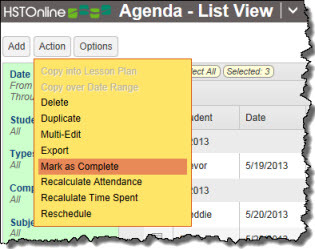 To delete multiple items at the same time, use the Delete action in the Agenda - List View. You can select any one or more Chores to completely remove them from your database. Choose the Chores you want to delete. Click the checkbox for each Chore you want to remove. You can create a printed list of Chores for any date range using the Daily Task List report. The report can include any combination of Appointments, Assignments and/or Chores. You can export a list of Chores for any date range to a .CSV file using the Export option under the More button in the Agenda - List View. The file can include any combination of Appointments, Assignments and/or Chores.